Football (soccer) is one of the most popular sports in the world, including Europe. It is associated with important betting activities. A common belief, widely spread among those who participate in gambling activities, is that knowledge and expertise on football lead to better prediction skills for match outcomes. If unfounded, however, this belief should be considered as a form of “illusion of control.” The aim of this study was to examine whether football experts are better than nonexperts at predicting football match scores. Two hundred and fifty-eight persons took part in the study: 21.3% as football experts, 54.3% as laypersons (non-initiated to football), and 24.4% as football amateurs. They predicted the scores of the first 10 matches of the 2008 UEFA European Football Championship. Logistic regressions were carried out to assess the link between the accuracy of the forecasted scores and the expertise of the participants (expert, amateur, layperson), controlling for age and gender. The variables assessed did not predict the accuracy of scoring prognosis (R2 ranged from 1% to 6%). Expertise, age, and gender did not appear to have an impact on the accuracy of the football match prognoses. Therefore, the belief that football expertise improves betting skills is no more than a cognitive distortion called the “illusion of control.” Gamblers may benefit from psychological interventions that target the illusion of control related to their believed links between betting skills and football expertise. Public health policies may need to consider the phenomenon in order to prevent problem gambling related to football betting. Football is one of the most popular sports in the world, Europe included. It is associated with important monetary transactions and financial sponsoring. Football competition is, unmistakably, a sport based on a high level of training and specific skills. This assertion may lead to the belief that football knowledge and expertise will allow better prediction of match scores. If unfounded, however, this belief should be considered a form of “illusion of control.” This term was defined by Langer as “an expectancy of a personal success probability inappropriately higher than the objective probability would warrant.” This type of distorted thinking was considered a major factor in gambling persistence and severity[7, 8], and led to the development of cognitive restructuring therapies for pathological gamblers. As suggested by Cantinotti, Ladouceur, and Jacques, to a certain degree, the utility of sport expertise in sport betting cannot be fully ruled out. For example, it was previously found that factors such as the home field advantage, team rankings, most recent results of teams, and injuries of key players significantly affect game results[10–14]. It was then suggested that skills could be helpful when betting on sports events. Probably in connection with these considerations in sport and football betting, defeats have been shown to be more often discussed than wins and were commonly attributed to unlikely or random events or were considered a “near win”, whereas wins were attributed to skills in selecting the victorious players. This interpretation probably contributes to an overestimation of betting skills. It would be relevant to determine whether expertise is essential for determining game scores. If this were not the case, the alleged skills in sports betting could be regarded as no more than a manifestation of the illusion of control, as observed in most gambling activities. With several exceptions, such as horse betting and hockey, the relation between gamblers’ skills and betting outcomes has been rarely studied. Studies that evaluated gambling skills rather than the role of expertise in sports for betting activities showed that monetary gains from gambling skills were not significantly higher than would have occurred by chance. Because of the wide popularity of football and football betting, it seems important from a public health policy perspective to assess the links between football expertise and prediction of match results. The present study examined whether football experts were better than non-experts for predicting the scores of the first 10 matches of the 2008 UEFA European Football Championship. During the 3 weeks prior to the beginning of the first match of the 2008 UEFA European Football Championship, a questionnaire was completed anonymously by 258 study participants recruited through local advertising and direct contact of football professionals (players, handlers, and referees) and sports reporters. The questionnaire assessed professional and amateur activity in relation to football. It also included five questions (Table1) related to the degree of football interest (questions 1, 2, and 3), the degree of belief in the link between a good knowledge of football teams and accuracy of match-related prognoses (question 4), and sport betting habits (question 5). In addition, participants predicted outcomes for the first 10 matches of the 2008 UEFA European Football Championship. 1) I am interested in football. 2) I am going to follow the Euro 2008. 3) I am a great fan of a team. 4) I think that a good knowledge of the teams allows me to predict with accuracy the match score results. 5) I often make sports bets (with monetary bets). “Experts”: The experts are professional or semiprofessional football players, coaches, or football sport journalists whose work was related to the 2008 UEFA European Football Championship. “Amateurs”: These participants have an amateur link with football (e.g., amateur referee) and/or play football as amateurs. “Laypersons”: This group has neither professional nor amateur connections. The forecasts were analyzed for winning accuracy (accuracy of the prognosis: winning team 1, winning team 2, or draw) and score accuracy (good score prediction). Statistical analyses were performed with SPSS for Windows (version 15.0). An initial exploratory analysis involved the calculation of proportions, as well as means and standard deviation of the outcome values. Spearman correlations with Bonferroni’s correction (p = 0.05/4 since four correlations were analyzed; p = 0.0125) were carried out to assess the links between each of the first four questions related to football interests and the fifth related to sports betting (Table1). Moreover, one-way analyses of variance (ANOVAs) were performed to compare the distribution of the mean numbers of correct outcomes and correct score predictions as dependent variables with regard to the above-cited first four questions as factors, adjusting for multiple pairwise comparisons. We also used a paired samples t-test to test whether gamblers had a greater number of correct outcomes than chance when forecasting the results of the games. Indeed, by chance, that is to say in the absence of any information, the probability of a gambler predicting 7 correct outcomes out of 10 games (0.016; the exact formula for the binomial distribution is given by p x = ( x n ) p x 1 − p n − x , where x is the number of successes and n the number of trials) is not the same as the probability of predicting 7 outcomes out of 10, given all the information in the bettor’s possession (0.7; given by the assumption: 7 correct outcomes out of 10 games). This last probability, referred to as conditional probability, means that before making a choice, the bettor will take into account all relevant information at their disposal. In addition to each participant’s observed probability of making the right bet, one may compare this to the expected probability based on chance. Finally, a binary logistic regression for each of the 10 matches was done to predict the accuracy of the scores (correct vs. incorrect score) with the participants’ expertise categories (expert, amateur, or layperson) as predictor, controlling for age and gender (female vs. male). For the categorical factors “gender” and “expertise,” the reference groups were levels 2 and 3, respectively. The classification table of the intercept-only model (baseline or null model) with that of the full model, where a significant improvement should be expected over the null model. The Nagelkerke R-square statistic with all the independent variables. This statistic attempts to quantify the proportion of explained variation in the logistic regression. The statistical tests of the predictors, using the Wald chi-square statistics. P-values less than 0.05, or alternatively, confidence intervals that exclude the “1” value, are suggestive of significant predictions. Two hundred and fifty-eight persons participated in the study (57% were men; mean age: 36.6 years ± 11.2). Fifty-five (21.3%) were classified as football experts, 140 (54.3%) as laypersons, and 63 (24.4%) as amateurs. Answers to the five questions in the questionnaire are reported in Table2. After Bonferroni’s correction was performed, the Spearman correlation showed significant associations between the first three questions related to football interest and sports betting (Spearman’s r = 0.49, r = 0.43, r = 0.41; p < 0.0005, respectively). Sports betting appeared to be associated with football interest. There was no correlation found between question 4 (believed role of football expertise for prognosis skills) and sports betting. The numbers and percentages of accurate outcomes and scores by category of participants are reported in Table3. 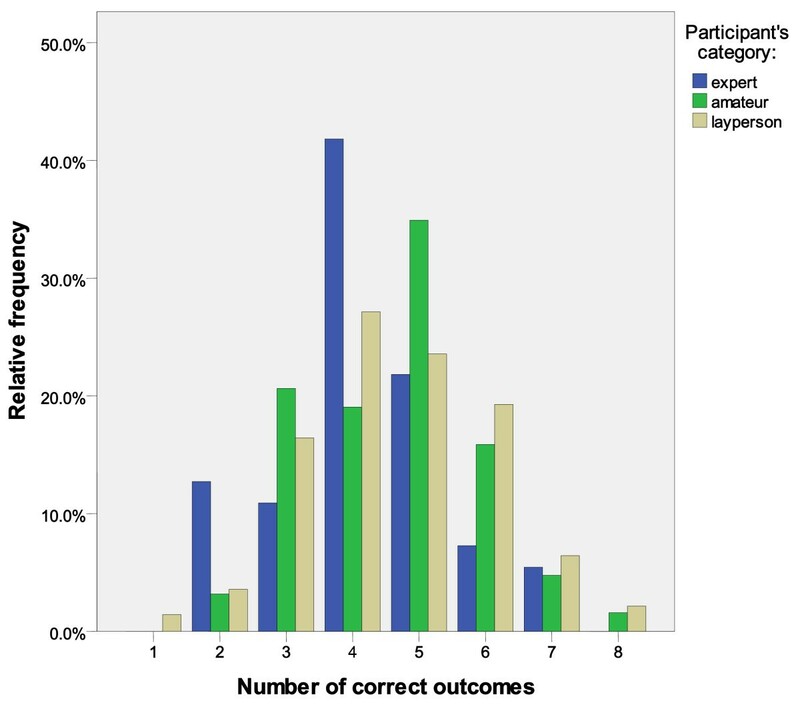 The mean number of correct outcome or score prognoses and the relative frequency of the distribution of correct outcomes by category of participants are reported in Table4 and Figure1, respectively. Distribution of relative frequencies of correct outcomes. The ANOVAs that were used to compare the distribution of the mean numbers of correct outcomes and correct score predictions with regard to the first four questions showed a statistical significant between-group difference for the mean number of correct outcomes (F(3,253) = 2.8 and p = 0.04) in question 4 (“I think that a good knowledge of the teams allows me to predict with accuracy the match score results”). But after adjusting for multiple comparisons, this difference was no longer significant. No significant difference before or after adjustment was observed for the other three questions. The paired sample t-test that was used to evaluate whether gamblers had a greater number of correct outcomes than chance when forecasting the results of the games showed a statistical significant difference (t = 39.15 and p < 0.0005). We conclude from the data that the bettors were more accurate in their predictions than chance. The logistic regressions, which were done to test the research hypothesis, yielded poor results. The classification table of the full models showed no improvement over the baseline models, meaning that the classification rates were exactly the same in both situations (Table5, column 2). The Nagelkerke R-square measures ranged from 1% to 6%, leading us to conclude that these models were not useful in explaining the outcome variable (Table5, column 3). Finally, the predictor variable “expertise” (Table5, column 4) did not prove significant except for the model involving the game Germany-Poland (p = 0.03, odds ratio = 2.57 and 95% CI for odds ratio = [1.08; 6.14]). This result means that compared with a layperson, being an amateur increases the likelihood of accurate score prediction by 2.57, assuming that the other factors in the model are held constant. There was no significant difference between experts and laypersons since the confidence interval includes “1” (exact results not shown). *Maximum iterations reached and final solution not found because group sample size too small. 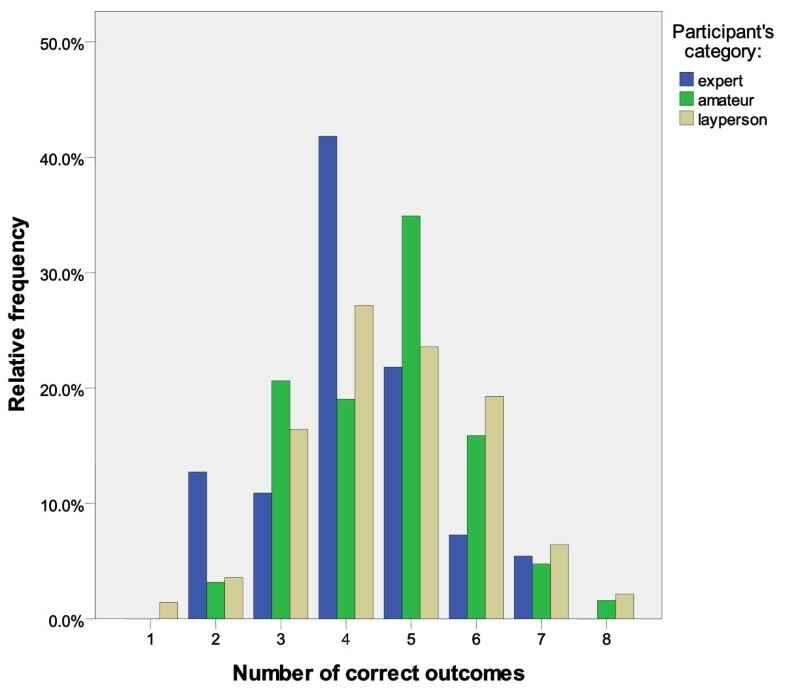 It is worthwhile noting that no expert was able to correctly predict more than seven outcomes and no participant more than eight (Figure1). In the present study, the results of the logistic regressions, although poor, were consistent across matches. Experts do not appear to be better than non-experts at predicting football match scores. Similarly, ANOVA results indicated that the average number of correct outcomes with respect to accurate scores were not significantly different across the four conditions (first four questions in Table1). The belief that expertise is useful for sports gamblers seems to be simply an illusion of control. By chance alone, the probability of someone predicting 10 correct outcomes (first winning team, second winning team, or draw) out of 10 games is estimated to be 1.7 100 , 000 , i.e., P X = 10 = 10 ! 10 ! 0 ! × 1 3 10 × 2 3 0 . The exact formula for the binomial distribution is given by p x = ( x n ) p x 1 − p n − x , where χ is the number of successes and n the number of trials. This is an interesting probability for the sports betting business, which mostly offers big monetary winnings on a combination of match results. Thus, in consideration of this probability and the lack of impact of expertise on football betting outcomes, sports betting appears to be nothing other than a game of chance, as suggested by other studies[7, 15]. As reported elsewhere, sport interest, rather than the athlete’s status, is possibly linked to sport betting. The finding of a lack of association between sports bets and the belief assessed in question 4 (“I think that a good knowledge of the teams allows me to predict with accuracy the match score results”) may result from the present sample being participants from the community and not problem or pathological gamblers. About 6% of the subjects did, however, consider this declaration as extremely correct and more than 30% as fairly correct, showing the wide diffusion of such beliefs. One possible limitation of the present study is that it was not carried out as a real gambling condition. The results should be then taken with caution. Further studies may include measures of gambling-related cognitions (e.g., fallacy, superstitious beliefs, biased evaluation of outcomes), participants’ betting behaviors and habits, and more detailed measures of expertise and self-confidence related to a sense of expertise, as suggested by wagering models. Further studies may also include betting related to other sport activities. Another limitation was the small sample of games surveyed and the non-random selection of these games, which resulted in a non-probability sample. Out of all matches that were played during the 2008 UEFA European Football Championship, only the first 10 were selected for analysis. The possibility that, by pure chance, the games selected happened to be more or less predictable than the standard ones should not be ignored. Finally, the logistic regression models set up to predict the accuracy of the number of goals scored by each team may have failed to take account of other possible significant predictors, such as the quality of the teams (ability to attack and/or to defend), the team’s league position at the time of playing, and the “home effect” (advantage in playing at home). The absence of these potential predictors may explain the small predictive power of our models. Expertise, gender, and age did not have an impact on the accuracy of the football match prognoses. Consequently, the belief that football expertise improves betting skills seems to be a cognitive distortion. Clinicians may inform gamblers about the limited help of football expertise in match-outcome predictions and the relative fallacy of commercial advertisements for sport betting, such as “….a sports bet is not the lotto… to place your bet efficiently, you must learn about football as a sport and follow a minimum of its championships.” Gamblers may benefit from psychological interventions that target the illusion of control related to their believed links between betting skills and football expertise. Furthermore, public health prevention policies may need to consider the present results in order to prevent problem gambling related to football betting. We thank the study participants, the football experts who agreed to participate in the study, GREA and Mr. Pascal Savary, the “Rien ne va plus,” the Geneva Health Department, Dr. Christine Davidson, Mrs. Alessandra Horn, and Mr. Christian Osiek. YK and DZ participated in the design of the study. YK and NG drafted the manuscript. AC performed the statistical analysis. JB, LB, GM, EF, GT, RK, and GB participated in recruitment and data collection. All authors read and approved the final manuscript.